ARLINGTON, VA- Virginia Delegate Nick Freitas has been endorsed by United States Senator Mike Lee (R-UT) in his bid to replace Tim Kaine in the U.S. Senate. When I met Nick, we had a long conversation about the need to restore the federal government to its proper size as outlined in the Constitution. After researching his voting record in Virginia’s General Assembly, it’s clear Nick Freitas will join me and Senators Rand Paul and Ted Cruz in championing our conservative principles. 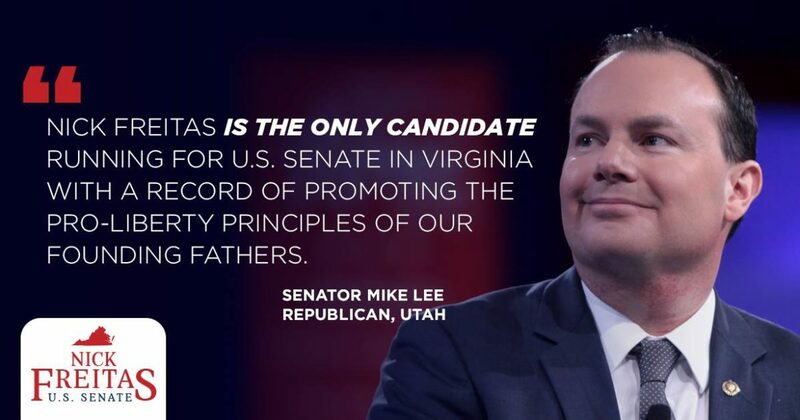 Nick Freitas is the only candidate running for U.S. Senate in Virginia with a record of promoting the pro-liberty principles of our founding fathers. This is the second endorsement for Del. Freitas from a sitting U.S. senator. Earlier this year, Senator Rand Paul (R-KY) announced his support. Nick Freitas is continuing to attract the attention and endorsements of some of the most liberty minded conservatives in the Commonwealth and the nation as his campaign continues to gain traction. Michael Feuz is a Loudoun County grassroots activist who has served in a variety of leadership roles within the Loudoung County Republican Committee and the Loudoun County Young Republicans. For the past two years he has been organizing events in the Arlington area called "Liberty Pubs" focused on bringing the ideas and discussing the philosophy and foundation of liberty and limited government to millennials.